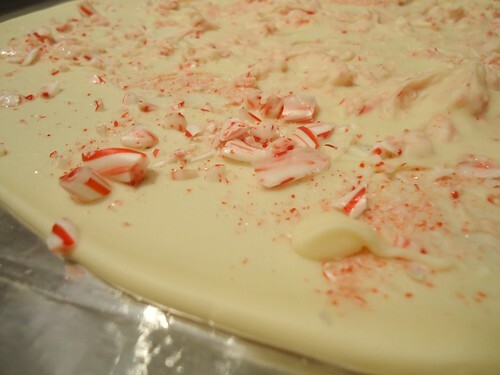 Alex and I both have childhood memories of making candy with our families, stretching salt water taffy across the kitchen or stacking blocks of fudge into boxes for gift giving. 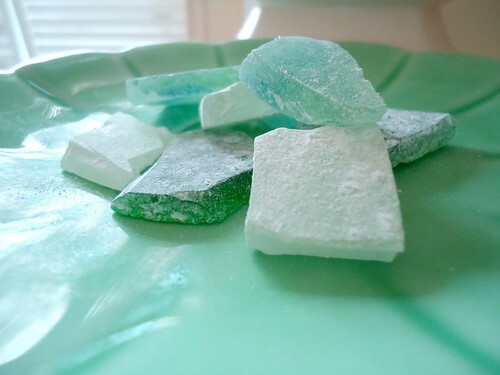 So with that tradition in mind, we made Sea Glass Candy. 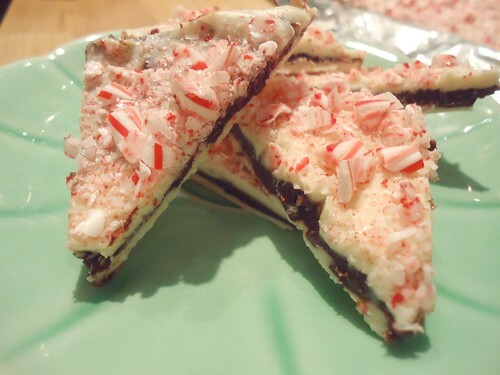 I adapted our recipe and methods from this recipe. 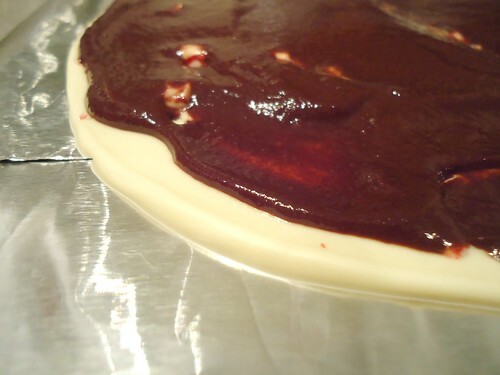 Grease large baking sheet with butter. Then measure sugar, water and syrup. 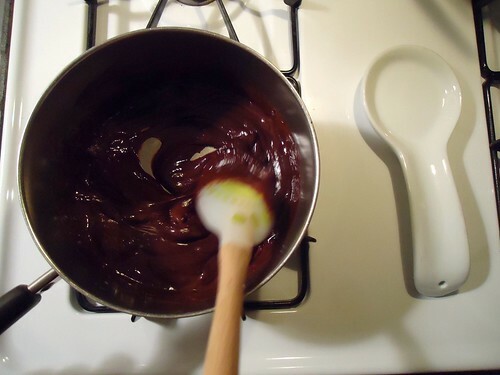 Pour into saucepan, place over medium heat and stir until sugar is dissolved. 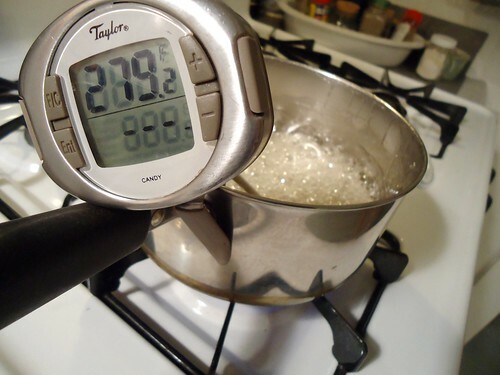 Place candy thermometer in pan and boil--without stirring-- until thermometer reads between 300F-310F*. This will take about 30 minutes. *Once your thermometer reads 279F, watch your pan very carefully. This is about 15 minutes into the process. You will start to smell the sugar cooking at this point. 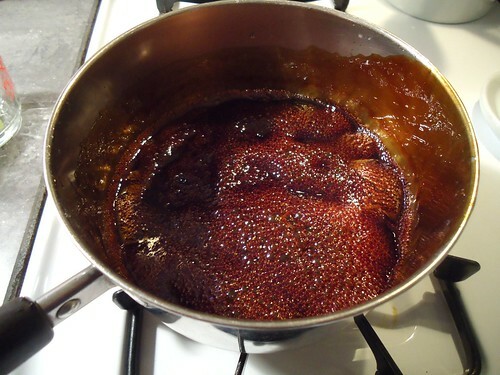 I found that the last half of the boiling goes very quickly and, as I learned when making my first batch, that once the sugar smells brown, or as my thermometer hit 295F, you have about one second between a good batch and a completely ruined batch. Like so. Gross. 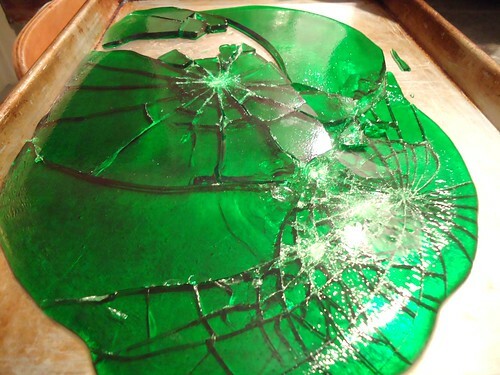 Here's a tip: when your kitchen is filling with hideous burnt sugar smoke and your formerly boiling sugar is quickly hardening in your only saucepan into a black, sticky mass, do not attempt to pour it down the sink (unless you want pipes filled with taffy.) 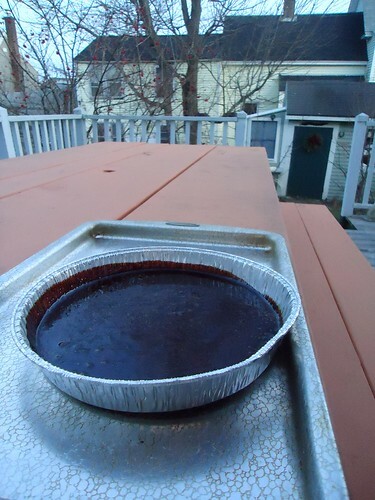 Luckily, I had some aluminum baking pans on hand and I poured the burnt sugar into one of those, and with protected hands, placed that on a baking sheet and placed it outside to cool completely before disposing of it. Like so. 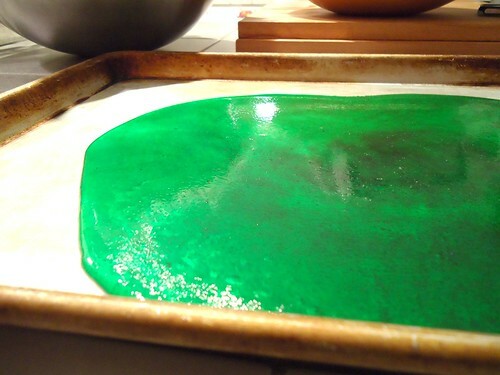 Once you've stirred the color and flavoring into the sugar, pour out onto your buttered baking sheet. 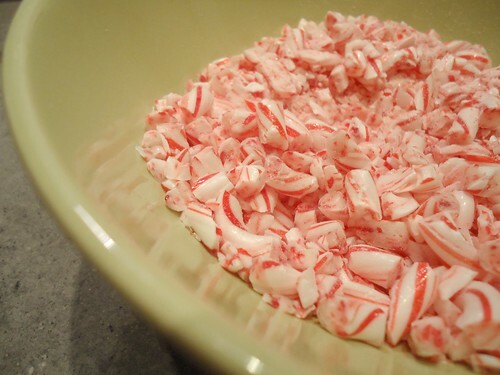 (At this point, you can swirl additional color into the sugar for a neat streaked effect, as suggested by my kids.) 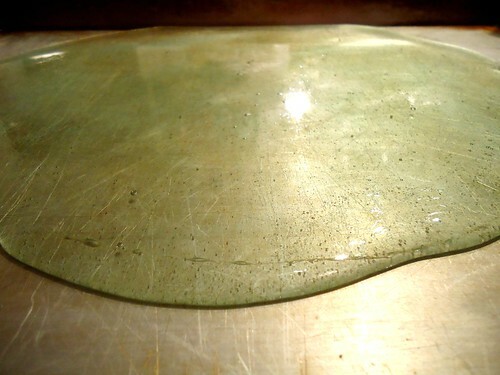 You do not need to spread the sugar out, simply let it cool. I put ours outside for about 15 minutes (it was cold) first, then moved it to the freezer for another 5 minutes. It will look something like this. Now comes the fun part. 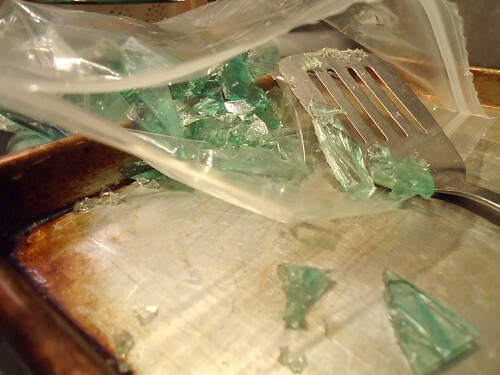 Once your sugar is completely cooled, cover it with a piece of parchment or wax paper and using a rubber mallet, rolling pin or hammer, tap your sugar until it cracks into pieces. A variety of sizes is best. 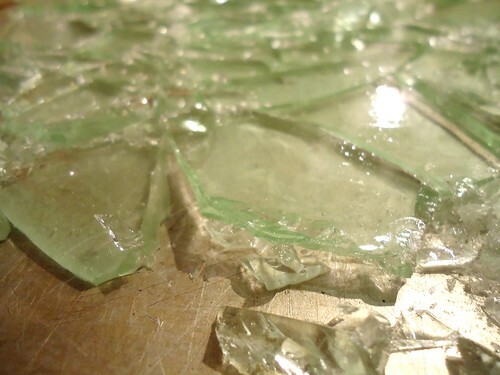 Overly large pieces should be split. 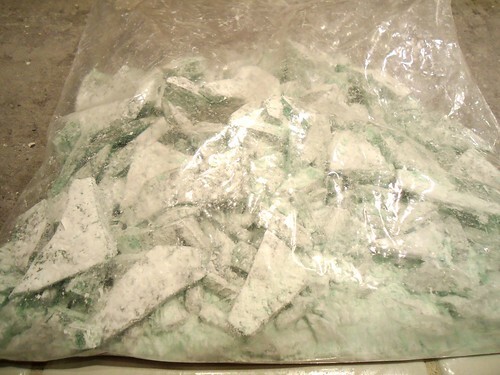 Then, scoop about a 1/4 cup of confectioner's sugar into a gallon resealable bag and scoop the broken pieces of sugar into the bag. Seal well, and shake to coat each piece. 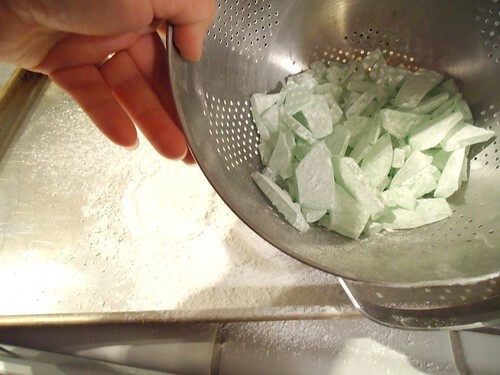 The candy should really start to resemble sea glass at this point, but removing some of the excess sugar in a colander, over a baking sheet, by stirring the pieces vigorously, really achieves that perfect sea glass look. 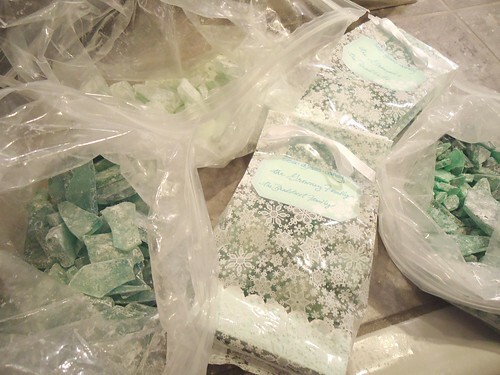 We did this to all three batches, each a slightly different shade of blue-green. We then filled gift bags with the candy and sealed for giving. What's cooking in your kitchen? I hope it's something sweet! So beautiful! I love the colors of this. I'm wondering what flavoring oil is? Would that be in the baking section of the store? That's new to me. I love your photos and words!! Wonderful! Happy Holidays! Grace and Peace, Amy V.
Hey, Amy, thanks so much! 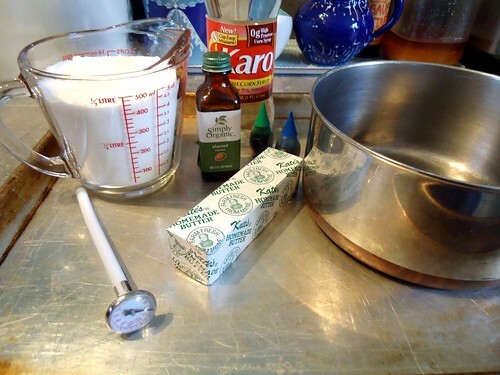 Flavoring oil or extract, like almond extract/oil, lemon, peppermint oil, etc. Yes, you should be able to find these in the baking aisles of any grocery store, usually near things like vanilla flavoring/extract, spices, nuts and cocoa powder. Many specialty kitchen shops also carry flavoring oils, often pricey, but very good. The almond extract I used was from Simply Organic. Merriest of seasons to you as well, and thanks for reading! 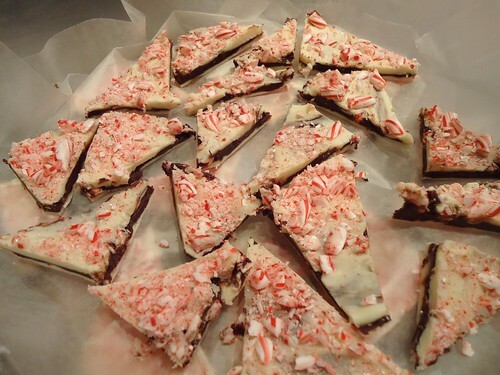 These look really fabulous Amy! 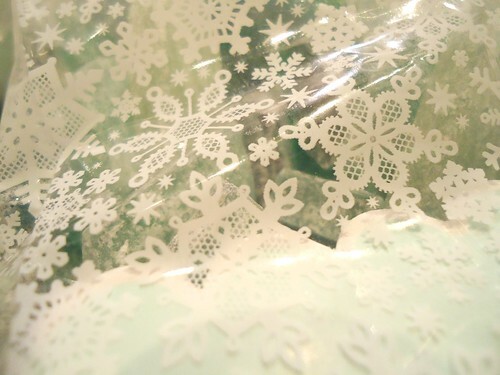 I love the snowflake bags, what a great touch to something already so beautiful. Have a great holiday! Yum. 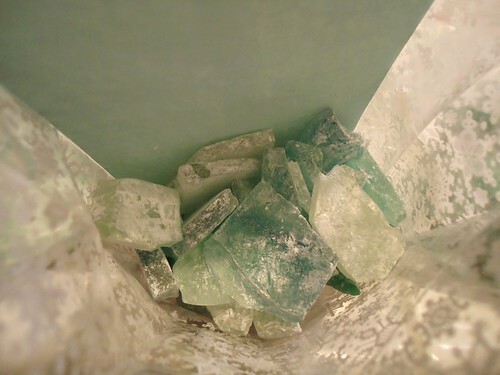 I have never heard of anything like sea glass candy. What a cool idea! And the whole color/texture of them is amazing! 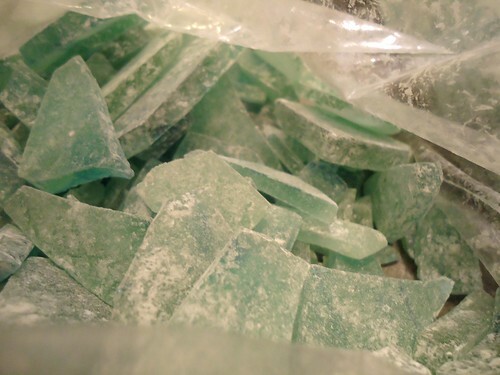 I haven't seen sea glass candy since I was a kid. I love the colors you made... so simple and beautiful. Thank you, Samantha! Alex found those bags when he was out with the kids picking up supplies. They are from Martha, of course.